Hello world! – For real! Normally, one of the first things anyone does is delete the obligatory “Hello world!” post from their site. I instead would like to use it to greet you to the ParaRational.com Merch Shop. If you aren’t familiar with our main website, we investigate the strange, unexplained and paranormal. 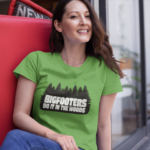 Over here though, we have the fun side with Bigfoot t-shirts, t-shirts with UFOs and much, much more. We truly hope you enjoy all our products and if there is something you would like us to make, just let us know!